Just like Facebook, I’ve deleted my LinkedIn account a couple of times. The difference is that I keep coming back to LinkedIn for some reason, while I’m a very happy non-user of Facebook. 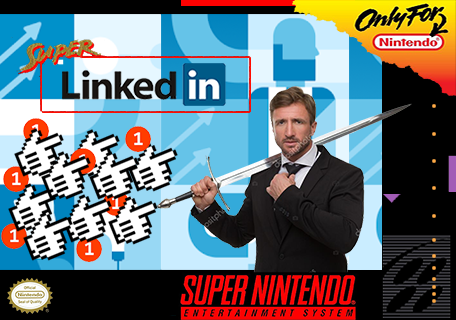 For those unfamiliar, LinkedIn is a 2D, turn-based MMORPG that sets itself apart from its competitors by placing players not in a fantasy world of orcs and goblins, but in the treacherous world of business. Players can choose from dozens of character classes (e.g., Entrepreneurs, Social Media Mavens, Finance Wizards) each with their own skill sets and special moves (Power Lunch; Signal Boost; Invoice Dodge). They gain “experience” by networking, obtaining endorsements from other users, and posting inspirational quotes from Elon Musk. The general goal of LinkedIn (the game) is to find and connect with as many people on LinkedIn (the website) as possible, in order to secure vaguely defined social capital and potentially further one’s career, which allows the player to purchase consumer goods of gradually increasing quality. Like many games, it has dubious real-life utility. The site’s popularity and success, like that of many social networks, depends heavily on obfuscating this fact. This illusion of importance creates a sense of naive trust among its users. This makes it easy to exploit. Yep, LinkedIn makes its money in a similar way to Facebook: allow users to create contacts on a platform completely owned by one company (which is now Microsoft). Then, charge them to beat the algorithm you created. Some people I know pay for LinkedIn Premium. I’ve never understood why when it’s effectively the front end for an address book. Instead, I pay for FullContact, which is a much better deal, long-term. Spend a few hours each day connecting with people. Start by searching for employees at powerful corporations like Google and Facebook. As users within various spheres of influence accept your connection requests, you will begin to gain legitimacy. At first a few people might decline your request, but eventually, once your network grows, important people will see that others they know are already connected with you, and accept your invitation without suspicion. Work your way through the corporate food chain like an intestinal parasite at a gratis conference buffet. I honestly don’t know why I continue to use LinkedIn. People message me on their occasionally, and I send (some of) my blog posts there. Other than that, it seems like people farming, just like a business version of Facebook. Previous Data transfer as a ‘hedge’?